We all need certain areas of our websites or designs to stand out, and one of those things are the prices of our products. So to help you make your prices stand out I created a brand new (v2) set of graphics. 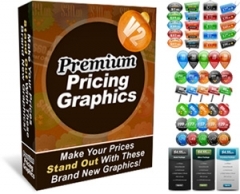 These graphics cover pretty much every way of how you can display your price?. you?ll get pricing tables, price stickers, price badges, price bubbles, price tooltips, and more.